After an interment, many families wish to know that graves are being looked after. Some families choose to do this on their own, and we encourage this, within our regulations. Please check with the Cemetery Warden before carrying out any work to be sure that it is within the regulations for that particular area of the Cemetery. Help us to care for the wildlife on site: please do not use chemicals to control pest or weed species, in particular, no slug pellets. Some families desire additional help in looking after the grave. York Cemetery Trust offers a service to keep graves clear of tall vegetation. 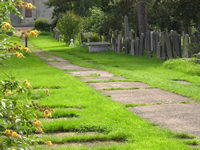 For a modest annual fee, the vegetation on the grave and around the headstone will be cut and permanent access to the grave provided. If this scheme is of interest to you, please contact the Office Administrator regarding enrolment procedures. Please note that this is not a maintenance scheme and does not include any other tidying or gardening of a grave or its memorial.